Description: American Woodcocks are adapted to year-round forest life. Well camouflaged, they often go unnoticed until flushed. They are chunky, dovesized birds with long, dull pinkish black-tipped bills; dull pink, gray, yellow or greenish-brown legs; and short, rounded wings. Mottled black, pale-brown and cinnamon upperparts have conspicuous wide black bars. Underparts are unbarred orange-buff. Underside tips of the tail are bright silver white. Similar Species: Other long-billed shorebirds are usually not inhabitants of woodlands in the Great Plains. 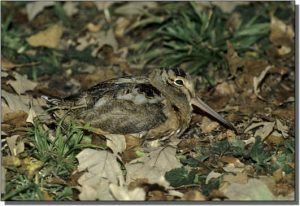 American Woodcocks have shorter legs, darker, shorter bills, more rounded wings and darker underparts than Wilson’s Snipe. Comments: The eastern Great Plains is the western edge of woodcock range. Most active at night, “timberdoodles” are found in moist mixed or deciduous woodlands where they probe deeply into the substrate for earthworms and other invertebrates. Males have display stations from which they attract females with spectacular displays, including a “peenting” call, aerial dives, trills and whistles. They are legally hunted in several areas across North America.